Clockwise from left: A February 2003 anti-war rally in San Francisco; an Occupy Wall Street protester in New York City, October 2011; A Palestinian flag flying at a July 2016 Black Lives Matter protest in Cleveland, Ohio. With the Black Lives Matter movement's adoption of a formal manifesto charging Israel with genocide, militant anti-Zionists are threatening to sabotage yet another progressive cause. 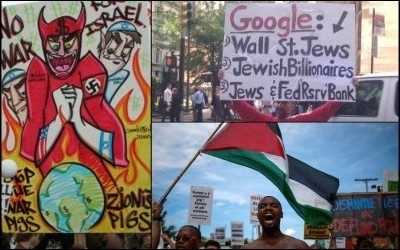 Obsessed with spreading demonization of the Jewish state across the Western world by any means necessary and at any cost, time and again anti-Israel campaigners have fought tooth and nail to insert defamatory anti-Israel language into resolutions and bylaws of unions, NGOs, political parties and other institutions advancing unrelated progressive agendas. Time and again, this hijacking has driven more enlightened activists out of the host movement, contributing to its decline. The phenomenon was first evident during the lead-up to the 1991 Gulf War, when many Jewish American peace activists encountered a threatening environment at antiwar rallies due to aggressive anti-Zionist campaigning. "I didn't feel comfortable or safe outside the Jewish contingent," said Betsy Tessler, leader of the Philadelphia chapter of the staunchly antiwar New Jewish Agenda. By the time the next Gulf War came around, militant anti-Zionists had become far more organized and determined not merely to piggyback their issue onto the antiwar agenda, but to push out those who were unwilling to accept it. The antiwar movement was primarily led by two far-left coalitions, International ANSWER (Act Now to Stop War and End Violence) and United for Peace and Justice (UFPJ), an uneasy partnership strained greatly by the former's promotion of anti-Zionist activists before the war even began. When Tikkun editor and leading UFPJ leader Michael Lerner openly criticized the anti-Israeli bent of the demonstrations in January 2003, ANSWER banned him from speaking at its rallies. This led to a splintering in UFPJ and an overall weakening of the antiwar movement. What accounts for the willingness of 'progressive' anti-Israel campaigners to sabotage other progressive causes? Much the same thing happened to the Occupy Wall Street movement that swept through New York and other major U.S. cities in 2011. The official Twitter account of the main OWS leadership in New York briefly endorsed the so-called "Freedom Waves Flotilla" that attempted to break through the Israeli blockade of Gaza in November 2011, while Occupy Oakland had an "Intifada tent" and the official Occupy Boston web site promoted an "emergency march" on the city's Israeli consulate. Mainstream OWS organizers refused to denounce protesters who carried anti-Israeli, and often brazenly anti-Jewish, signs and banners. Daniel Jonathan Sieradski, a liberal Jewish writer and activist who led a well-attended Kol Nidre prayer service across the street from the protests in Zuccotti Park on Yom Kippur, warned that the growing infusion of anti-Israel messaging into official OWS activities was leading "many Jewish supporters of OWS who do not identify as anti-Zionist" to believe "that they could no longer be associated with the movement." "Once this movement becomes explicitly anti-Israel, you'll have effectively alienated three times more people than you'll attract," he predicted. Within a few months, the movement was effectively dead. A related dynamic was evident in the unraveling of Britain's Labour Party this spring, driven by the reluctance of Jeremy Corbyn and others to disavow a small minority of radical anti-Zionists within the party's ranks. Britain's Jewish community, which "once looked to Labour as its natural home," wrote leftist Guardian columnist Jonathan Freedland, one of the country's leading Jewish journalists, "is fast reaching the glum conclusion that Labour has become a cold house for Jews." It's difficult to find a progressive cause that hasn't been compromised in some way by the so-called Boycott, Divestment and Sanctions (BDS) movement, from the anti-globalization movement to the fight against sexual assault. "BDS destroys everything it touches,"observes Cornell law professor William A. Jacobson. Anti-Zionist 'progressives' have thoroughly wrecked the Palestinian cause. Perhaps the most thoroughly wrecked, ironically, is the Palestinian cause. Having occupied the commanding heights of Middle East Studies departments in many major Western universities, anti-Zionist "progressives" have tiptoed around religious extremism, oppression of women and other social maladies in the Palestinian territories for fear of distracting attention away from Israel. They have even been willing to ride roughshod over Palestinian artistic freedom in their zeal to defame Israel. The most unnerving aspect of Columbia University's controversial 2003 Palestinian film festival wasn't the anti-Israeli tone of many of the films (any legitimate selection of Palestinian art is going to be unflattering to Israel), but the fact that films depicting Palestinian suffering at the hands of Arab governments were conspicuously nixed. In light of the fact that many prominent Palestinian filmmakers grew up in Arab refugee camps, and have depicted this experience often in their work, this was a glaring omission (somewhat akin to a Woody Allen tribute excluding films set in New York). 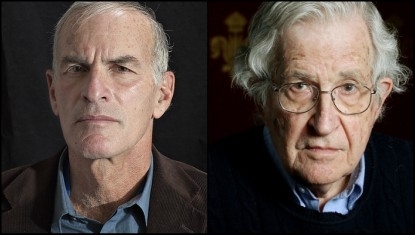 Staunch Jewish anti-Zionists such as Norman Finkelstein (left) and Noam Chomsky (right) have disavowed the BDS movement. Such militant Jewish anti-Zionists as Noam Chomsky and Norman Finkelstein have come to disavow the BDS movement less because it defames Israel than because the defamation has no real aim. Holocaust inversion (e.g., "Bibi and Hitler are the same; the only difference is the name! "), boycotts, and other BDS tactics, glaringly reminiscent of Western anti-Semitism in the past, are the last thing that will cause Israelis to see the "error" of their ways—utterly counterproductive as a persuasive tool. From its inception three years ago, Black Lives Matter—and the movement to end police brutality against African Americans in general—received unwavering support from progressive Jewish organizations, such as T'ruah and the Jewish Community Relations Council of Greater Boston (JCRC), which in turn facilitated more mainstream acceptance of Black Lives Matter and its aims. Although plenty of individual BLM leaders fell in with the BDS movement in the face of sustained pressure, plenty of others worked to keep bridges with sympathetic Americans as open as possible. All that seems to be going up in smoke since the adoption of the new platform. "We cannot and will not align ourselves with organizations that falsely and maliciously assert that Israel is committing 'genocide,'" the JCRC said in a statement. "We reject participation in any coalition that seeks to isolate and demonize Israel singularly amongst the nations of the world." "[We] are extremely dismayed at the decision to refer to the Israeli occupation as genocide," replied T'ruah. Harvard law professor Alan M. Dershowitz, a longtime campaigner against police abuses, warned that the "obnoxious and divisionary platform plank may destroy [BLM's] credibility with regard to police abuse in America." There was backlash even within the African American community. The Ecumenical Leadership Council of Missouri, which represents hundreds of predominantly African American churches throughout the state, issued a statement saying it "rejects without hesitation any notion or assertion that Israel operates as an apartheid country" and reminding the public that Jewish Americans have "worked with African-Americans during the civil rights era when others refused us service at the counter — and worse." What accounts for this extraordinary nihilism on the part of supposedly progressive BDS activists? Holding an extreme position on Israel is one thing—that can be the result of ideology, religious beliefs, ignorance or something else. Being willing to sacrifice all other causes and concerns ordinarily convergent with one's worldview for the sake of hurting the Jewish state is something altogether different. The BDS movement's unusual grade of nihilistic anti-Israel antipathy is a hallmark of classical anti-Semitism. This unusual grade of obsessive, self-destructive antipathy is a hallmark of classical eliminationist anti-Semitism. Unlike ordinary intergroup prejudice "found in the suspicion and resentment which are often directed against neighbors of another tribe, another race, another faith, or from another place," explains historian Bernard Lewis, anti-Semitism is a "special and peculiar hatred" that attributes to Jews "secret and diabolical power." Against such a perceived enemy, no sacrifice is too great. Nazi Germany's diversion of much-needed resources in the final months of World War II from fighting the Red Army (and providing for the escape of German refugees) to exterminating more Jews makes sense only to someone who sees the latter as a cosmic evil. Although anti-Semites often go to great pains to avoid expressing their hatred as anti-Jewish (indeed, they coined the term "anti-Semitism" itself as a politically correct euphemism for Judenhass), this unique cognitive signature is easy enough to spot—just take a measurement of what the subjects are prepared to sacrifice to harm Jews. To date, however, mainstream liberals in America have been reluctant to call out the anti-Semites wreaking havoc within the ranks of the Left. If black lives—or socioeconomic justice, peace, women's rights, etc.—really matter to them, why have they allowed the cancer to metastasize this long?